Live band karaoke is where your guests can come up and sing with the band. In other words, you get to come up on stage, take the microphone and rock out with one of the best bands around. Why do we let people sing with us? In the Karaoke Kings, we believe music is to be shared. Participated in. Yes, it is great to listen to a band that really knows what they’re doing. After all, we do! Unlike most live band karaoke outfits, the Karaoke Kings can actually sing the songs themselves. Members of the Karaoke Kings have performed/toured with many greats, from Stevie Wonder to the Neville Brothers. All our musicians are top players, and our singers can really sing. We perform as a “traditional” band all the time. 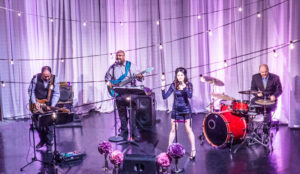 We often mix up our gigs live band karaoke gigs with sections of just us performing. However, watching a band isn’t the same thing as being on stage yourself. Bringing people up to sing with us brings energy, excitement and a level of audience participation that is hard to match. And the reason I keep putting “traditional” in quotes is that a traditional band isn’t all that traditional. Back in the day before recorded music, everyone made their own music. People gathered around campfires and in living rooms and sang the songs themselves. That is what humans are built for: not just listening to music, but participating. It isn’t required that you know what you’re doing. All that is required is that you’re human – and even that requirement bends! So come sing with us!